I just found out my daily stop at the smoothie shop has been adding nearly 2,500 calories to my diet per week! I'd like to start making my own blended beverages at home, but I have no clue where to start. What are some good low-calorie smoothie ingredients to stock up on? This swap for dairy milk is a great foundation for any smoothie. (Need proof? You got it.) It adds creaminess, plus a touch of vanilla flavor. Even better? It has less than half the calories of skim milk. I'm also nuts about this almond-coconut blend! 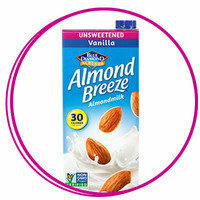 Find almond-based alternative milks in both the fridge and shelf-stable sections of the market. For many of us, a life without peanut butter would be a sad existence! But no need to put down that spoon… unless that spoon is mixing powdered peanut butter! It's like regular PB, minus most of the fatty calories! (And, of course, it's a powder not a puree.) 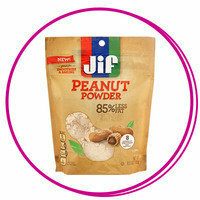 These days, you can find it right in the peanut butter aisle; brands like Jif make it. Add it to smoothies to get that rich taste you crave, sans guilt. This classic Hungry Girl smoothie combines the miracle powder with chocolate and banana! Feel like you're stuck in a summertime sauna? Stock up on frozen mango chunks for beat-the-heat refreshment. 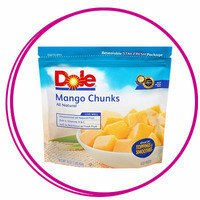 They're so sweet, they can eliminate the need for excess sweetener in your smoothie. They also add just the perfect texture to your cool-down concoction. Case in point: This Beyond Berry Mango Smoothie. Other excellent frozen fruits for blended beverages? Mixed berries, pitted dark sweet cherries, and DIY banana slices. HG tip: Check the ingredients to make sure no sugar has been added. Don't be scared! 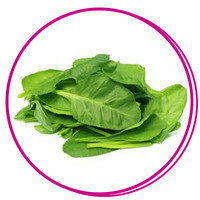 As long you don't go overboard with the leafy greens, spinach blends seamlessly into fruity blended beverages. Plus, it's chock-full of vitamins and minerals to supercharge your smoothie. Try it in this hint-of-mint vanilla shake or this peachy breakfast smoothie. You don't need to go to the Caribbean to get those relaxed beach vibes. 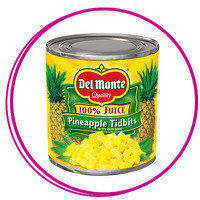 Canned pineapple -- be it crushed, tidbits, or chunks -- can transport you in an instant. It's a tropical smoothie must! Just watch out for syrup-soaked varieties, and stick with fruit packed in juice. Your starter smoothie: This Tropical Cherry Freeze. 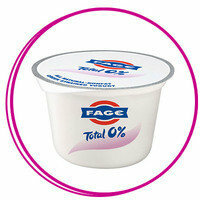 Speaking of texture enhancers, just a small amount of Greek yogurt will thicken your tasty blend in a flash. The rich and creamy ingredient also adds protein and calcium. If you're skeptical of its tartness, try vanilla yogurt or a fruity variety. Ready for recipes? GOOD. Attention, chocolate cravers! You can eat clean and still get your fix. Add some unsweetened cocoa powder to your smoothie for instant gratification without all the sugary calories. The trick is to add a no-calorie sweetener packet or two (like the natural kind by Truvia). Try HG's Oreo Frappe to taste the combo in action. 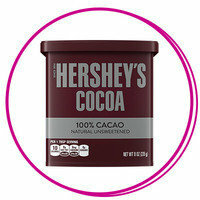 And for even richer flavor, try unsweetened dark cocoa powder. 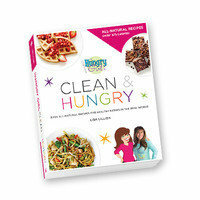 You've got to grab a copy of Hungry Girl Clean & Hungry. 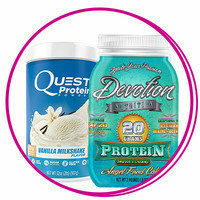 It features eight incredible smoothies and shakes, all 100 percent natural and under 200 calories! The Purple Power Smoothie is a personal favorite -- only four main ingredients! Today, July 19th, is National Hot Dog Day. Why have a boring ol' frankfurter, when you could have a crazy-good Corn Dog Muffin? Don't even think about keeping these smoothie staples all to yourself. Click "Send to a Friend" or forward them now.